In 1924 Hugh Comstock came to Carmel to visit his sister Catherine and her husband, George Seideneck, both artists and members of the struggling Carmel Art Association. While in Carmel, Hugh met Mayotta Browne, who successfully made and sold rag and felt dolls, called “Otsy-Totsys.” Hugh and Mayotta married that year. Buyers from large cities came to place orders for the dolls, which soon filled their house to overflowing. She asked Hugh to build her a cottage to use as a showroom. Hugh was neither a builder nor an architect, but he loved to draw and tinker. 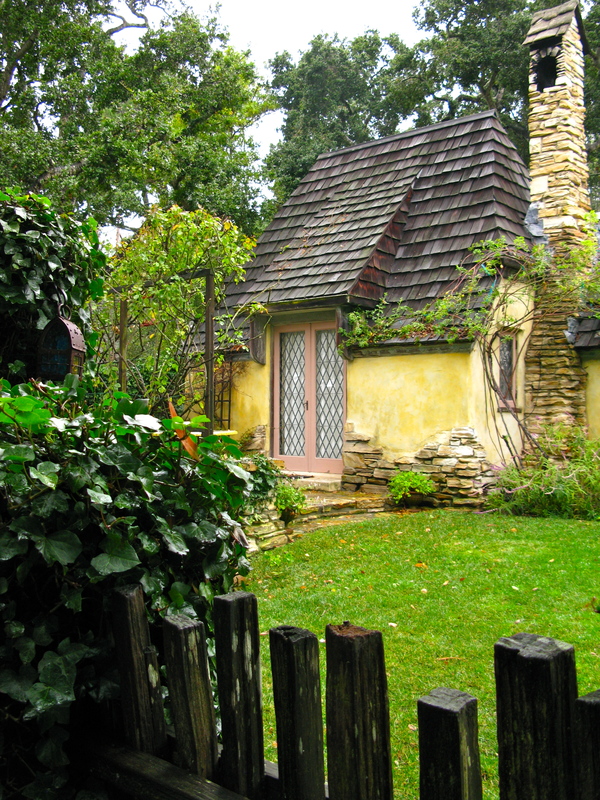 He designed and built with Mayotta a whimsical little cottage, Gretel, on Torres near 6th, inspired by the watercolor illustrations of the British children’s book illustrator Arthur Rackham. The little cottages seemed to grow from the ground they rested on. Hugh purposefully did not use a carpenter’s level, so the lines were untrue and the chimneys crooked. 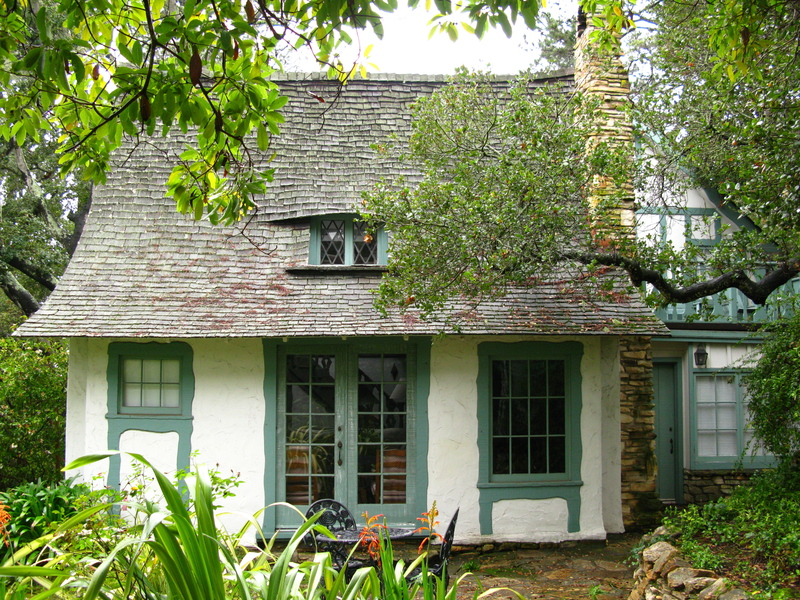 Hugh’s own studio, built in 1927, corner of Santa Fe and 6th, was inspired by an English country house. The exterior walls are stuccoed and trimmed with wood, irregularly carved, at cornices, windows and doors. The roof is steeply pitched with irregularly-cut shakes. 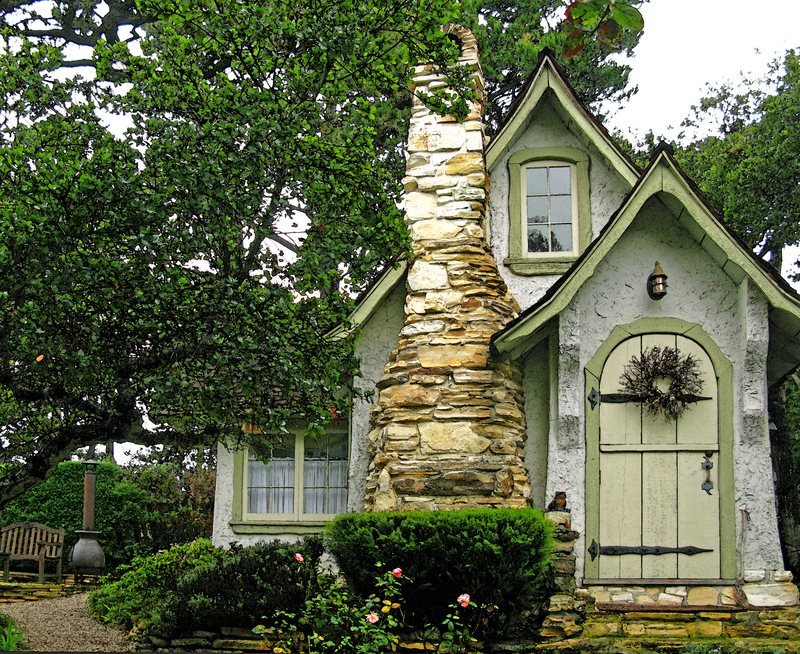 The narrow, tall chalk-rock chimney has a Gothic pot. This is a “sneak peak” at Hugh Comstock’s studio which later became his wife’s residence. It has a beautifully kept garden that discourages the photographer and tourist. Nevertheless…. Gorgeous little homes. All magical. i want this for my mother n law cottage…..who has the plans?????? Love it!!! I’M SERIOUS.